Picking up where we left off last week, let’s continue our look at the handheld game series Nintendo released but never saw fit to keep alive to this day. This time our subject is the Game Boy Color, the only video game system in history to use Comic Sans as its logo typeface. I’m going to get a little personal here, as this is one of my all-time favorite games, and with good reason. I’ll discuss the merits of Crystalis in a moment, but I'm first rewinding to 1990, when I was ten years old and desperately trying to complete this game but without success. I was stuck in the penultimate level, the pyramid. I wrote a letter to the Nintendo Game Counselors at Nintendo Power. I even decorated the envelope with carefully-traced Crystalis box artwork (they used to print the best envelope art in Nintendo Power, sort of a predecessor to the Miiverse, you might say). And I waited. To my astonishment and delight, a Nintendo game counselor wrote back! The letter was fully customized to my predicament, and to me (“But the battle’s not over yet, James!”) I was so excited, I immediately popped in the game and followed the advice verbatim. I had even patched my NES through a VCR ahead of time, and when I finally defeated Draygon and completed the game, I pressed “record” and saved the victory for all time on VHS. I think I still have that tape somewhere. Of course, such personalized aid is now obsolete thanks to GameFAQs and other wonders of the internet, but for all its flaws Crystalis — and Nintendo — still hold a very dear place in my heart because of that. 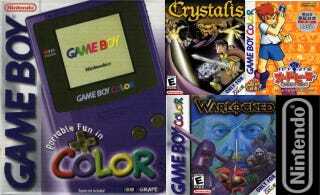 Then Nintendo nearly ruined it with a mediocre Game Boy Color port. By the time 2000 rolled around, I had only a Game Boy Color, having sold my entire console and games collection to date to finance college, including my NES top-loader and Crystalis. I was thrilled to be able to play the game again — and really let down by Nintendo’s effort. Their biggest mistake essentially ruined the nostalgia for me: they REPLACED THE SOUNDTRACK. Maybe they had a good reason. Maybe SNK didn’t license its spectacular soundtrack along with the game’s already good graphics, decent story (also butchered by Nintendo) and varied landscapes. Yes, the average enemies and gameplay were intact, but without the soundtrack, it suddenly became a very average game to me. I beat it once and never played it again. Now is Nintendo’s chance to make things right after 23 years and bring Crystalis to Virtual console. Other SNK games made the jump, so this seems reasonable. And given the topic of this Kotaku Talk Amongst Yourselves series, a sequel — by Nintendo or anyone else — is LONG overdue. Like Crystalis, this isn’t really a Nintendo IP, given its creation by defunct British developer Bits Studios; but Nintendo was the first and only publisher. It was one of a very small number of original IP produced by Bits, who specialized in licensed movie games for LJN, Sony and THQ, among others. Praised by critics and lauded by IGN as a Virtual Console candidate, Warlocked and its cancelled sequel Wizards are real-time strategy titles in the vein of Ogre Battle or StarCraft, but with obviously much more simple gameplay. The game actually appears to be quite good for its age and platform, and could make for an interesting sequel or remake on 3DS. I “get” trading card games. I don’t play them, and I’m not interested in them, but I can see the appeal of “Magic: The Gathering” and “Yu-Gi-Oh!” and such. What I don’t “get” and will never really understand is the concept of making these kinds of games into video games. Sort of defeats the purpose, doesn't it? I mean, if you’re going to go to all the trouble of making a game based on playing card “fighting” based on random values, why not just go all the way and make it a turn-based RPG? But then, my bias is exposed as I have never played any video game trading card games, either, so I cannot speak to the quality of games like Dragon Ball Z: Harukanaru Densetsu or the extremely meta Pokemon Trading Card Game: The Video Game. At any rate, the Japan-exclusive Trade & Battle: Card Hero was successful enough to spawn a single sequel on DS and a port of that game to DSiWare. My guess is Nintendo decided to discontinue the series lest they start canibalizing Pokemon sales. My series on Nintendo’s forgotten franchises is almost complete! Next week, we go 3-D with Nintendo’s answer to the Oculus Rift, 20 years early and of, um, “different” design. More than 2,000 Classic PC Games, "Free"